This chapter is an acrostic poem, the verses of which begin with the successive letters of the Hebrew alphabet. Unspecified in Bible. I have set the scene at sunset. The setting sun (out of view, off to the right) provides the light in this scene. Notice the orange sunlight from the setting sun on the edges of the figure & battlements of the walls in the left foreground. 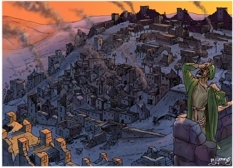 01) (This page) Lamentations – Sorrow in Jerusalem – Scene 01 – Desolate city (Dark version). In which the city scene is darker in tone. 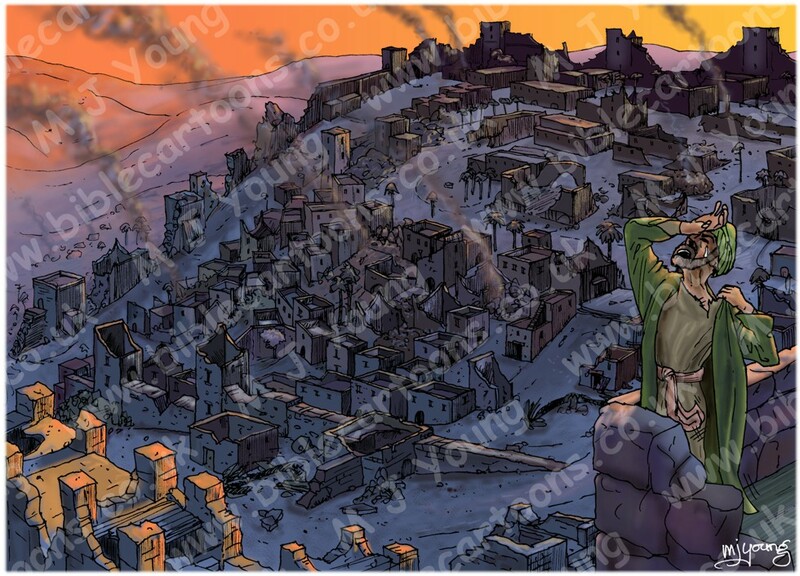 02) (Next page) Lamentations – Sorrow in Jerusalem – Scene 01 – Desolate city (Lighter version). In this version the city and background are lighter in tone. “The city” (verse 1) refers to Jerusalem. In my picture you can see the prophet Jeremiah (called the weeping prophet) in the bottom right hand side of the scene, weeping & tearing his clothes in anguish as he looks out from some high vantage point over the broken walls & homes of Jerusalem. I have drawn an aerial view of part of the city, looking from the North East towards the South West. Directly below the viewer is the Kidron valley, & you can see the Hinnom Valley behind the city walls, on the South side of the city (the left hand side of the scene). From the viewers position the city descends away (to the left) downhill towards the city walls on the south side of Jerusalem – this is the City of David section of Jerusalem. You may also notice that the city comprises small houses in the lower centre of the picture (the Old City) with much larger houses at the top of the hill (the Upper City) where wealthy people no doubt lived. To the left of Jeremiah’s raised elbow is a shattered theatre, also in the Upper City. If you look closely you will see that I have drawn many broken walls, towers, trees & houses in the city. There is also smoke from fires set by the Babylonian army, who breached the walls & invaded the city. “Lamentations begins with the Hebrew word Eicha (how? ), and the book is known in Hebrew as Megillat Eicha (the scroll of Eicha.) The book is a theological and prophetic response to the destruction of the First Temple (Beit Hamikdash), in Jerusalem, in 586 B.C.E. The Talmud (The Babylonian Talmud, Tractate Bava Batra 15a) states that it was written by the prophet Jeremiah, who lived at the time of the destruction. Chapters 1, 2, and 4 of Lamentations are an alphabetical acrostic, with each line starting with another letter of the Hebrew alphabet. Chapter 3 is a three-fold acrostic, with three lines for each letter of the alphabet. Many Bible commentaries attribute the prophet Jeremiah as the author of this book. He may even have been present in Jerusalem at the time of the Babylonian invasion of 586 BC. “Why is Lamentations so important?